Swiss mathematician and physicist who was a giant in the 18th century for his creativity and productivity, including the development of integral calculus. In physics, he developed theories of lunar motion. A special case of a formula published by Euler in his Introductio ad analysin infinitorum (1748), Vol. 1. However, he did not print it, either there or elsewhere. An early printing, maybe the first, is due to J. F. Français in Annales des mathematique pures et appliquées 1813-1814, 4, 66. The formula was also highlighted by the American mathematician Benjamin Peirce around 1840. But its rise to 'fame' remains obscure. For since the fabric of the universe is most perfect and the work of a most wise creator, nothing at all takes place in the universe in which some rule of the maximum or minimum does not appear…. From Methodus Inveniendi Uneas Curvas (1744), 1st addition, art. 1, translated as an epigram in Ivor Grattan-Guinness, Convolutions in French Mathematics, 1800-1840: From the Calculus and Mechanics to Mathematical Analysis and Mathematical Physics (1990), Vol. 1, 285. If a nonnegative quantity was so small that it is smaller than any given one, then it certainly could not be anything but zero. To those who ask what the infinitely small quantity in mathematics is, we answer that it is actually zero. Hence there are not so many mysteries hidden in this concept as they are usually believed to be. These supposed mysteries have rendered the calculus of the infinitely small quite suspect to many people. Those doubts that remain we shall thoroughly remove in the following pages, where we shall explain this calculus. As quoted in G. Simmons Calculus Gems (1992). Quoted as said upon losing the use of his right eye. In Howard Eves, Mathematical Circles (1969). Webmaster has not yet found a primary source. Can you help? Lisez Euler, lisez Euler, c’est notre maître à tous. Quoted in Petr Beckmann, A History of Pi, 157. Accordingly, we find Euler and D'Alembert devoting their talent and their patience to the establishment of the laws of rotation of the solid bodies. Lagrange has incorporated his own analysis of the problem with his general treatment of mechanics, and since his time M. Poinsôt has brought the subject under the power of a more searching analysis than that of the calculus, in which ideas take the place of symbols, and intelligent propositions supersede equations. J. C. Maxwell on Louis Poinsôt (1777-1859) in 'On a Dynamical Top' (1857). In W. D. Niven (ed. ), The Scientific Papers of James Clerk Maxwell (1890), Vol. 1, 248. Euler’s Tentamen novae theorae musicae had no great success, as it contained too much geometry for musicians, and too much music for geometers. Paraphrase by Brewster to describe Fuss’ opinion of Euler’s 'Attempt at a New Theory of Music' (1739). In David Brewster, Letters of Euler on Different Subjects in Natural Philosophy (1872), Vol. 1, 26. The remark by Fuss appears in his eulogy, read at the Imperial Academy of Sciences of Saint Petersburg (23 Oct 1783). Published in the original French in 'Éloge de Léonard Euler, Prononcé en Français par Nicolas Fuss'. Collected in Leonard Euler, Oeuvres Complètes en Français de L. Euler (1839), Vol. 1, xii. We may safely say, that the whole form of modern mathematical thinking was created by Euler. It is only with the greatest difficulty that one is able to follow the writings of any author immediately preceding Euler, because it was not yet known how to let the formulas speak for themselves. This art Euler was the first one to teach. As quoted in W. Ahrens Scherz und Ernst in der Mathematik (1904), 251. As translated in Robert Édouard Moritz, Memorabilia Mathematica; Or, The Philomath’s Quotation-Book (1914), 183. 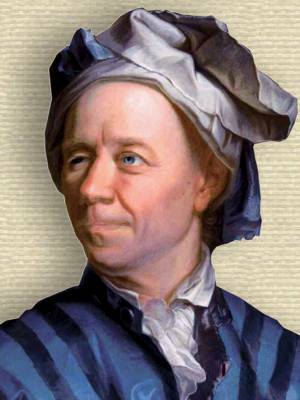 15 Apr - short biography, births, deaths and events on date of Euler's birth. Euler: The Master of Us All, by William Dunham. - book suggestion.